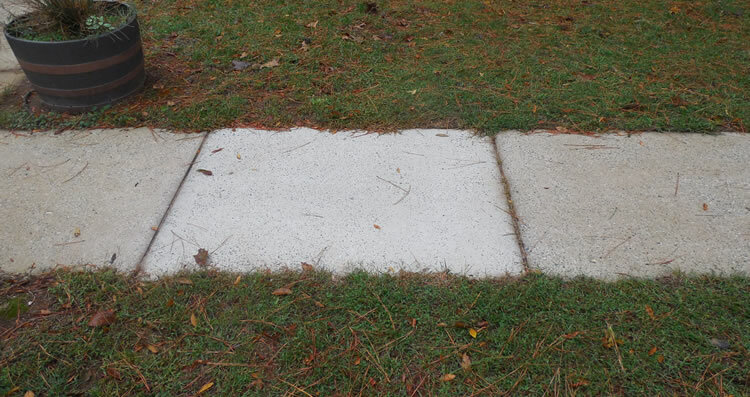 Do you have a sidewalk on your property or along your business frontage that is getting a little dirty? Being that sidewalks are so frequently used it’s no wonder they are constantly in need of a good cleaning. From chewing gum to tar and grease to graffiti and algae, moss and more, if you don’t have the right tools for the job cleaning a sidewalk can be a difficult task. We mentioned algae and moss above and these are two really big issues that property owners have with their sidewalks, especially those that are in shady areas or in a constantly moist environment. It’s not uncommon for concrete sidewalks to look almost overgrown with algae only to find out it wasn’t power washed a few months earlier! Dave Mac’s Power Washing is a full service power washing company based out of Charlotte, NC. We specialize in washing sidewalks for home and business owners throughout Charlotte. Through the use of special equipment and cleaning methods we are able to restore the look of sidewalks to almost like new condition. For sidewalks that are frequently dirty or in need of cleaning especially those in heavily trafficked commercial areas we do offer custom maintenance programs as well. We can assess your situation and then set a schedule where we can come and power wash your sidewalks once every month, few months, year or whenever you’d like us too. We can stay on top of things if you’d like us to.